I was 2 days shy of 36 weeks, when my water broke. I called the midwife on call, she told me to just keep an eye on it and I didn't need to come in unless I started getting contractions that were 5 minutes apart, lasting for 1 minute, for at least 1 hour- the "511 rule" as I had learned in birthing class. We relaxed and snacked and watched TV shows for a while. I was having a few contractions spaced far apart, but they weren't that bad- I had to stand up and sway through each one, but I was back to myself in between each contraction. But then something kicked in and I felt like I needed to be ready to go to the hospital. I put in a quick load of laundry and added things to my partially packed hospital bag. I asked Mike to run out to Target for me to grab a few things for my hospital bag. It was only a little before 5 and Mike hadn't been gone long when hard contractions kicked in. Each contraction stopped me dead in my tracks, but I continued to try to pack my hospital bag in between contractions. I wanted to be packed and ready to go. Half an hour into the contractions they were only 5 minutes apart. What? That closeness of contractions generally takes hours and hours, especially with first babies. Mike got home with the items I had asked him to pick up for me. I told him I'd been having intense contractions and he began to jot down the time of each one. We knew from birthing classes and our midwives the importance of the 5-1-1 rule. Often when women come into the hospital too early it stalls their labor because their bodies aren't as relaxed as they would be at home. But before an hour of the intense contractions could even pass, my contractions were just 3 minutes apart. I told Mike I felt the baby's head bearing down and I wanted to go to the hospital now! 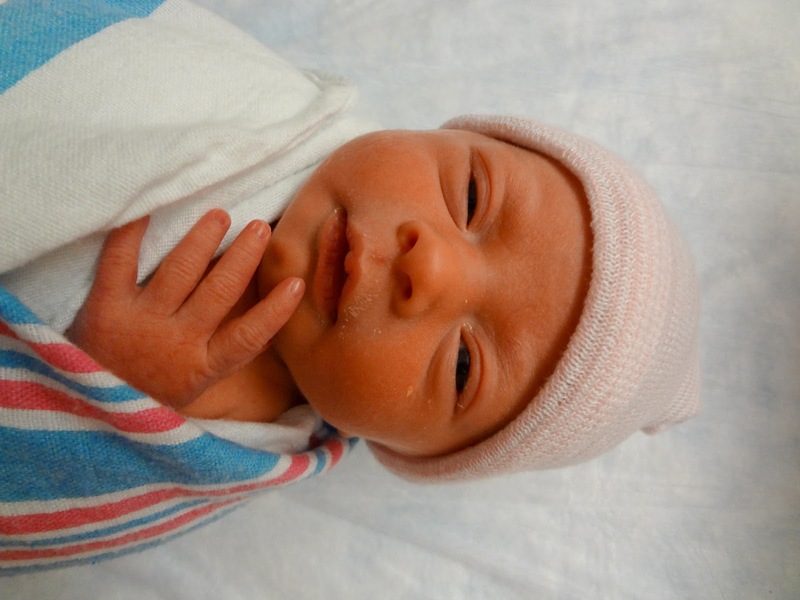 That was it, the 5-1-1 rule was out the window for us, we called the midwife and rushed to the hospital as fast we could. On the car ride to the hospital I began to feel like we wouldn't make it. I was dizzy, and felt like I was blacking out, and I had loooooong contractions during the 15 minute race to the hospital. Once we arrived Mike wanted to walk up to Labor & Delivery with me. But despite the short spacing and intensity of my contractions I still didn't believe I would be having a baby this quickly I figured I'd have at least a few more hours of labor since I hadn't been in active labor that long. He walked me into the desk and after I urged him to park the car and meet me in Labor & Delivery he raced off to park the car and get back to me as fast as could. (Later one of our nurses asked him, "Are you the guy we saw sprinting across the walk way?" Apparently, hospital bags in hand, he had sprinted full speed from the parking deck to the Women's Hospital completely bypassing the mandatory photo ID check in). I was escorted up to L&D in a wheelchair and was taken to triage. The triage nurse began to take my vitals. The nurse stepped out and I felt the wave of another contraction hit. I did not want to be on my back. When Mike walked in to the triage room a few moments later I was on my hands and knees, yelling. The contraction subsided and a minute or less later another wave hit, but this was different, my brain turned off and my instincts kicked into full gear. Still on my hands and knees rocking back and forth I told Mike to get someone I was going to push now and no waiting for hospital protocol anymore. Mike rushed from the room to the nurses desk, and told the triage nurse who had just taken my vitals that we needed to see the midwife now, I was ready to push. I got the feeling from the triage nurse that she wasn't taking us too seriously. But of course, why should she think I was this far into labor...I was a first time mom and had only been in hard active labor for 2 hours by now. She came in and checked me herself (we had been waiting for the midwife to finish another delivery and then come check me). As she checked me she pulled out her phone and began dialing. "I'm going to need NICU, I'm going to need a nurse, I'm going to need room 1. Fully dialated plus 2!" She turned to Mike and told him he'd need to wheel my bed because everything needed to happen fast. I was taken to room 1 (the room reserved for emergency births) I saw people rushing into the room. There were nurses, a NICU team, doctors and within minutes one of the UNC midwives, Kathy (I couldn't have been happier to see anyone at that moment! I love those midwives!). As soon as I saw Kathy I asked her when I'd start pushing. "As soon as we can get you set up." she responded, it was happening now. One of the L&D nurses jotted down my birth plan requests for Caroline (since I wanted a natural birth we had a formally written birth plan but there wasn't time to go over that now). The NICU team explained that they'd lay her on my chest if she came out crying, but if not they'd have to take her to NICU. Within minutes I was set up to push. I could have cared less that the room was full of people, I was in pure instincts mode and just focused on Kathy and her coaching. I could not have imagined a better pushing coach, she was exactly what I needed. She told me it was going to get worse before it got better, but that this was what I had to do. I focused hard and with each contraction and each push reminded myself that the only way to make the pain subside was to reach towards more pain first. It worked for me. 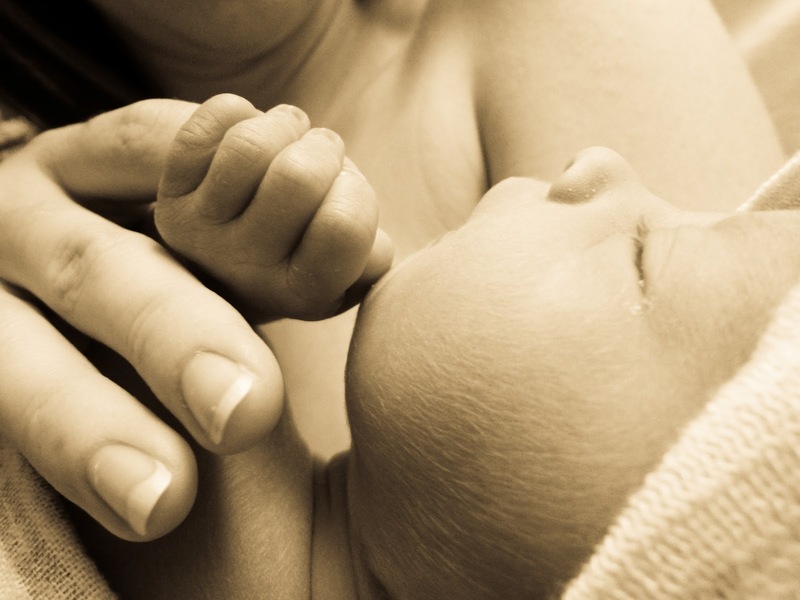 It enabled me to find a purpose within my pain, something we learned about natural birth in our birthing class. 4 long pushes later Caroline was here, screaming at the top of her lungs. Kathy wiped her off and laid her on my chest and as soon as she was on my chest she quieted down. After a few minutes the NICU team took her to make sure she was okay, but they checked her in our room. Not long after, the room began to empty and it was just us and the L&D nurse. I began to feel like I was going to pass out and they had to give me an IV. This happened more than once that evening. Apparently I had lost so much blood and things had gone so quickly my body was in shock. After a few scary spells of almost passing out, a couple bags of IVs and lots of juice, water, and some food I had stabilized blood pressure. 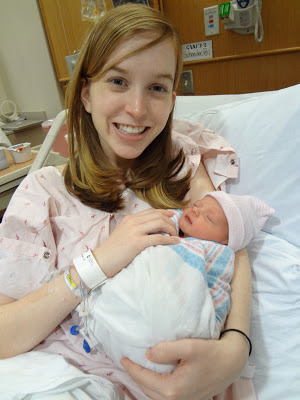 I wasn't able to hold Caroline a whole lot that first night because I was weak from blood loss (apparently red heads bleed significantly more than others). The next couple days and nights in the hospital were both blissful and stressful. We admired our tiny daughter, but she had to have extra tests done since she was a month pre-term. The upside is she passed them all with flying colors. The lactation consultants were wonderful, UNC hospital has around the clock LCs on duty who will visit your room every feeding. And with Caroline being pre-term they were extra attentive to us, which was helpful. The pediatricians who visited our room were also wonderful. And each morning the midwife on call stopped by to check on me. But by the time day 3 came I was so happy to go home... it's near impossible to get sleep in a hospital and I barely slept during our stay there. 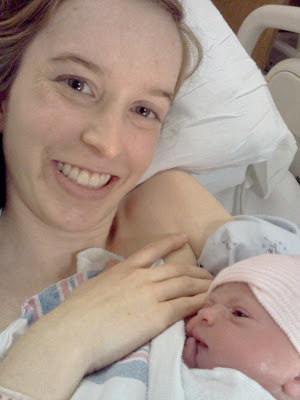 Reflecting back on Caroline's birth experience, I am amazed at what a crazy but wonderful experience it was. I was able to have the natural birth I so wanted. But it all happened so fast that I'm still a little dazed trying to wrap my mind around what happened. 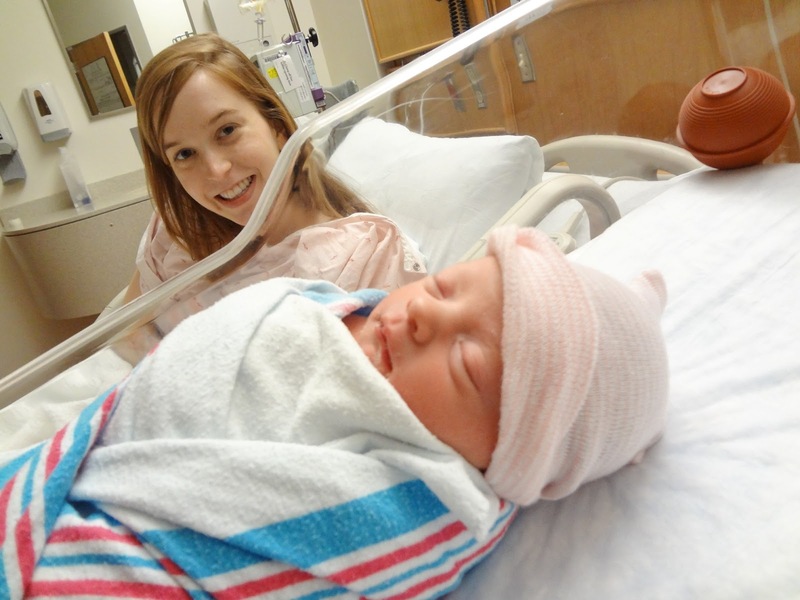 Giving birth and being able to do it naturally was the most incredible experience of my life. 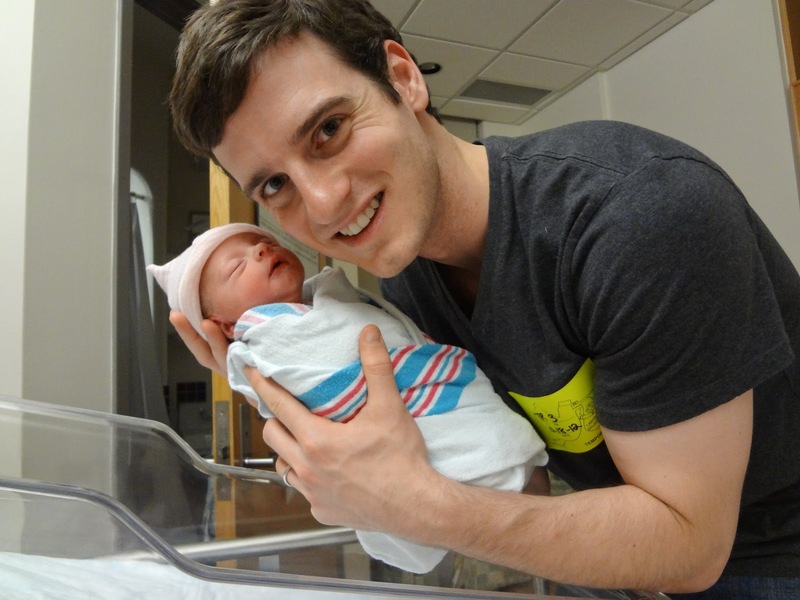 We love you little C.
Wow, that was quick for your first birth. Way to go you for going natural, that's awesome. She is precious! Love you, and glad you are feeling better~! Wow ! Excellent post.I read your posting first to last and I'm interest to your next post.If you have any time please visit here about to know more information astrology reading.